This sleek and modern rolling serving cart design features two spacious black glass shelves and a handy built-in three-bottle wine holder to help you entertain in style. A sleek look that makes entertaining a breeze, this 2-shelf rolling serving cart has everything you need for an upscale cocktail party. Featuring a chrome finish and two tempered black glass shelves, the intriguing rounded edge delivers the sophistication you love. A three-bottle wine rack keeps open bottles from spilling as you mill about an elegant gathering, serving drinks and appetizers. 31 1/2" high x 28 1/2" wide x 15 3/4" deep. Weighs 14.12 lbs. 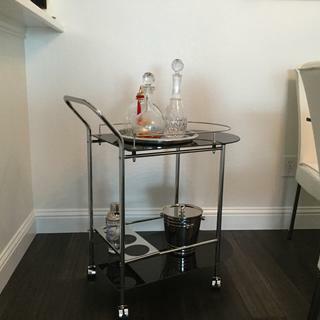 Contemporary 2-shelf rolling serving cart. Each shelf holds up to 10 lbs. Chic style perfect for casual or formal entertaining. Two 5mm black tempered glass shelves. Rim around top shelf keeps items from falling off. Steel construction. Chrome finish frame. 3-bottle wine holder. Durable black polyurethane caster wheels roll easily. The quality is great and the cart is very stable. It's a great deal for the price when compared to other bar carts of similar quality. I'd strongly recommend this. Great looking cart. Adds a nice touch to my dining room! Instructions were good and nothing else needed, easy to assemble. Good quality and looks outstanding. I would recommend to a friend. I saw this and knew I had to buy it. It fits a perfect spot in my living room and is functional as well. I know there are carts that are higher quality and look more expensive, but for me this was a great find.